Studying the earths interior can help us to understand earthquakes, volcanoes, plate tectonics and more about the inner earths natural processes.These layers of the earth interact in ways that affect life on the earth. In general the earths interior has been sorted by Gravity. Heavier elements like iron tend to sink toward the center or core of the earth. 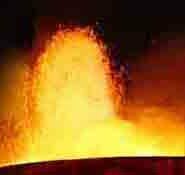 Lighter materials, the silicates, oxygen compounds and water have risen to become part of the crust. This action has created distinct layers within the earth and is still in process today. The crust of the earth is very slowly growing thicker. Volcanic activity is continually adding mass to the crust. Though the crust is solid it is made up of about 12 plates. They are called Tectonic Plates. These plates are in constant motion. The movement is caused by convection currents in the mantle. The movement is very slow, averaging about 2 inches a year. This is about like the growth of your fingernails. The crust is about 0.5 % of the earth’s total mass. The crust is made up of silicate rocks such as granite and basalt. 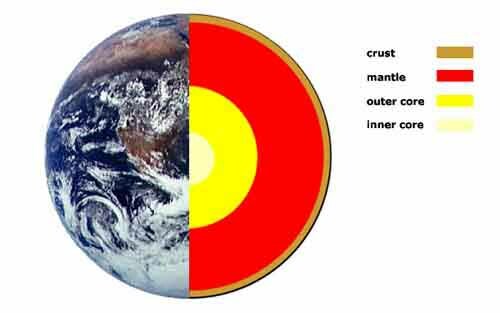 The continental crust is much thicker than the oceanic crust as shown here in the diagram of the earth's crust. Oceanic crust - The crust under the oceans is about 10 km thick and is generally made up of rock rich in iron and magnesium. These are primarily basalt formed by volcanic action at the mid ocean ridges. The oceanic crust is denser than continental crust. Continental crust (continental cratons) - Where there are continents the crust is about 30 to 50 km thick. It is made up of igneous, metamorphic, and sedimentary rocks. The continental crust is less dense than the oceanic crust. When the continental crust collides with oceanic crust through plate movement the continental crust rides over the top of the oceanic crust while the oceanic crust is pushed back down towards the mantle. Much less is known about the mantle than the crust. The crust we can see, measure, dig and drill. The mantle is different. We have little direct contact with the inner earth. We can tell some things about the mantle by studying volcanoes and what comes out of them. Much of what we believe is true about the earths interior comes from studying Seismology. Seismology began as the study of earthquakes and the seismic waves they produced. These waves travel through the earth and move at different speeds in different materials. By studying these waves and how they move through the inner earth we can learn about the its structure. Is made up of rocks rich in magnesium and iron, and poor in silica; mostly peridotites. It is about 400 km thick and is much denser than the crust. The core is composed primarily of a nickel-iron alloy. There is an outer core that is liquid and an inner core that is solid. Outer core Is about 2100 km thick. It makes up about 30 % of the Earth's total mass. Inner coreIs about 1300 km thick. It makes up about 2 % of the Earth's total mass. There are distinct layers to the earth’s interior. Much more is known about the crust than the mantle and core. What we believe is true about the mantle and core comes from studying seismology.